The Chorale ensemble practicing in The Clarice Smith Performing Arts Center. Haleigh Whisted/Mitzpeh. 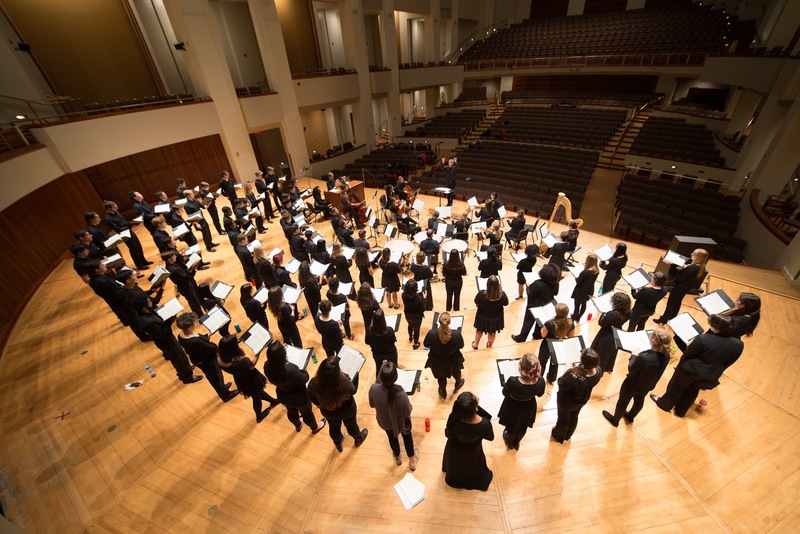 The University of Maryland College Park School of Music hosted the Fall Choral Showcase last Sunday evening, celebrating famous composer Leonard Bernstein’s centennial, using the voices of this university’s Chamber Singers and Chorale ensembles. For the final song, conductor Edward Maclary combined three of Bernstein’s most popular compositions, the Chichester Psalms, for the two chorus groups to sing in unity. Bernstein wrote these pieces in Hebrew sacred text for the commissioning of the Anglican Chichester Cathedral. His Chichester Psalms were first showcased at the Chichester Festival in that cathedral in 1965. Carol Howell, a member of the audience, felt that the two choirs did a magnificent job coming together to sing for the last performance. The choice to sing in the original Hebrew was for “no religious statement,” said Jonathan King, one of the Chorale’s graduate student conductors. Singing in Hebrew for every song performed that night was a simple choice for the conductors because it honored the great Bernstein, he said. Marin Alsop, the Baltimore Symphony Orchestra music director, sought out the two ensembles to sing with the orchestra for a performance honoring Bernstein that will occur next semester, said King. Alsop was a student of Bernstein’s and has celebrated his life’s work on multiple occasions through music. Each piece—three from the Chamber Singers and four from the Chorale preceding the finale—displayed a different composer from various time periods, the earliest dating back to the 1500s. Combining sacred text in the Hebrew language and various composers’ music from different time periods, King felt that the pieces greatly challenged the students and represented the variety of genres and dates of the music that these ensembles tend to sing. The mother of a senior in the Chorale, Barbara Butler, found “Seek Him that Maketh the Seven Stars” to be melodic, reverent and beautiful. Jonathan Dove composed this song in 1959 and the Chorale performed their version of it that evening. Well-renowned musicians like soprano singer Aidan Stanton-Brand, organist Steven Seigart, harpist Cara Fleck and percussionist Tim McKay also contributed to the showcase. King said the organ was one of the most critical aspects to consider when it came to choosing compositions to perform before the final song. He and Chorale graduate student conductor Minji Kim saw a lot of organ used in Bernstein’s Chichester psalms, so to conform to the theme of Bernstein’s centennial celebration, they chose to add an organist in some of their performances, as did Maclary with assistant conductors Lucas Link and Kathryn Hylton. “Historically important” is how Kim described the musical choices of the student choir groups. She said that every year a new graduate student of the school of music gets assigned as a conductor to the Chorale, so the music style and taste differs significantly. Mainly, though, conductors choose music from older periods like Renaissance, Classical or Romantic. Kim also explained that the Chamber Singers and Chorale students, some participating for pleasure or class credit, have been working on these pieces that she, King and Maclary have conducted since the beginning of October. The Fall Choral Showcase was a chance for her, as a graduate student, and the students, as singers, to display their diligence and skill. No Replies to "Two ensembles combine to celebrate life of composer Leonard Bernstein"